The coin is a lot more than just a token. It connects us to our history, can signify a country’s independence, can be a thing of aesthetic beauty, and, just occasionally, it can be exchanged for a bag of peanuts and a pint of ale. It is little wonder then that the humble coin can carry vastly different values that are not always represented by the numeral on the coin itself. In the broadest sense, a coin’s value can be judged by its face value, the content of the precious metals it is made up and its historical significance. 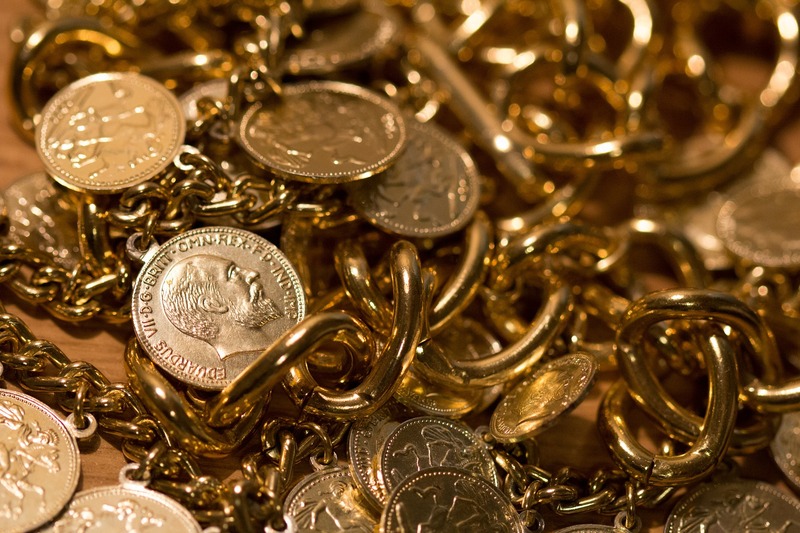 The following are some of the most valuable coins in the world today. One of the best ways to ensure a coin’s value is by error. These produce the kind of rarities that make collectors salivate at their very thought. The 1913 Liberty Head Nickel was produced unofficially, without the consent of the U.S. Mint. This led to only five of the coins making their way into circulation. As is self-explanatory, the Liberty Headed Nickel depicts the face of Lady Liberty, while the official coin of the era depicts a Native American figure on the obverse. Despite the coin being in less than perfect condition, it sold for $3.7m. Falsely named the 1804 Silver Dollar, it was in fact printed in 1834 by mistake and presented to rulers from Asia during a visit to discuss trade. 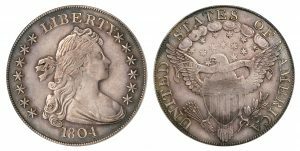 There are in fact two cases of the “1804” Silver Dollar selling for huge numbers, one in 2008, which sold for $3.8m, and another in better condition that sold for $4.1m. As previously mentioned, mistakes often pay off in the long term when minting coins. In 2007 the Royal Canadian mint set a world record by minting the 100kg Gold Maple Leaf. There were in fact five of them produced, all being sold to private collectors around the world. One of the advantages to owning a 100kg coin, you would think, is it is likely to put off thieves, but in 2017, thieves stole one of the Canadian Big Maple Leafs from a Berlin museum. 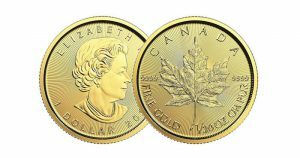 The coin has a face value of $1m Canadian dollars, but it’s gold content alone means the coin is worth in excess of $4.1m. The age of a coin is generally a decent indicator of its value, although many other factors play a part. 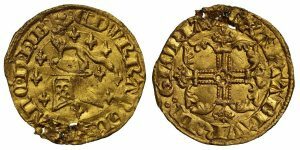 The Edward III Florin is by far the oldest on the list and is incredibly rare as a result. In fact, it is something of a surprise that three of them have survived almost 700 years to make the list. The coin is a perfect example of human fascination with our history and our currency’s connection to that history. It is currently valued at just under $7m. Obstinance may not be a trait that you might associate with the minting of coins, but that’s exactly what it took for the Brasher Doubloon to come into existence and make this list more than 200 years later. When Ephraim Brasher petitioned the government to mint a set of copper coins, they rejected the request and the use of copper coins in general. Unperturbed, Brasher produced them anyway and continued to mint more of his own coins, some of which were gold of high purity (22 carats). One such coin sold at auction for $7.6m. 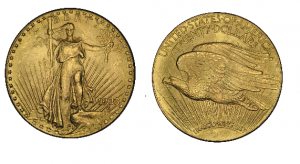 The original design for the Double Eagle was so complex that the U.S. Mint could not produce it in viable numbers. When redesigning the coin, the engraver took it upon himself to add the words “In God We Trust”, something now widespread in U.S. currency. At the time, however, congress were outraged and very few of the coins now exist. Such rarity led to the coin selling for $7.6m. Few coins have such ironic value as the 1933 Double Eagle. After the stock market crash of 1929, Franklin Delano Roosevelt banned the owning of gold to ease the banking crisis that was destroying the country. 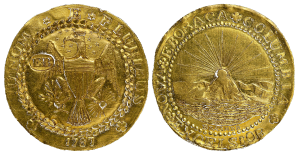 In 1933 the Gold Double Eagle had already been pressed, however, and just twenty survived the subsequent cull. This, once again, links great events to a country’s currency, and the coin is thought to be worth more than $7.5m. With a face value of $1 and made of the relative cheap materials of silver and copper, this coin’s value is almost entirely due to its historical significance. The first ever $1 coin produced by the American Mint, which had very recently come into existence, the coin is legendary. 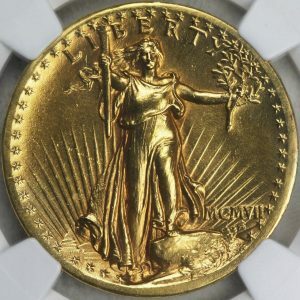 Named after the depiction of Lady Liberty on the coin’s obverse, which shows the figurehead with flowing, long hair, it is valued at over $10m.